Strange but true fact: Our bodies are made of more bacteria than human cells, and the gut alone contains trillions of microbes (bacteria and fungi). In fact, it's estimated that the body is composed of 10 times more bacteria than human cells. And the intestines are home to more bacteria than any other part of the body, including the skin. Now, scientists are devoting increasing amounts of time and resources to understanding the gut 'microbiome,' as the massive collection of bacteria and microbes is called -- and the influence it may exert on the brain and body. The National Institute of Health's Human Microbiome Project, for instance, is devoting millions of research dollars to understanding the microorganisms living within the human ecosystem. Of particular concern among scientists and the public is the effect that gut flora may have on mental health, as a mounting body of research suggests that gut bacteria can have a significant impact on the way we think, feel and behave, and also on the development of neurological conditions. Last year, a major neuroscience symposium called the investigation of gut microbes a "paradigm shift" in brain science. A number of diseases and disorders have been linked to abnormalities or instability in gut flora, and the microbiome is an important area of research for these conditions. However, it's important to note that while research has linked these conditions to alterations in the microbiome, it does not mean that in every case gut bacteria is the cause of the problem. 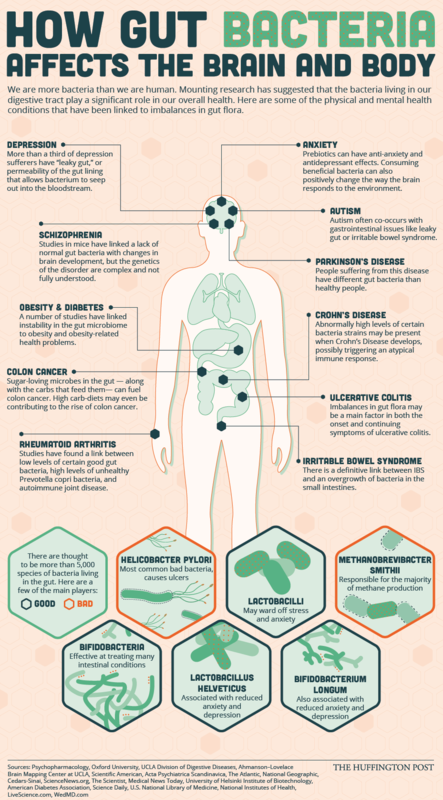 Here are a handful of physical and mental health problems that have been linked to imbalances and abnormalities gut bacteria.